Welcome to the RevX Billing University Library where you have access to topics that highlight solutions to a variety of customer challenges. Our technology and market experience combine to create a powerful tool that will accelerate your go to market effort. These articles have been authored to capture some of the obscure things many customers fail to consider in their decision making process. FREE access to this repository while seemingly proprietary in nature, only serves to enhance our working relationship because it brings depth and clarity into our conversations by establishing that operations and billing are a detailed part of your business and we have your back! The Internet of Things (IoT) Growth Challenge! The Internet of Things (IoT) has brought opportunities to Verizon partners and resellers, but as deployments multiply, management and billing becomes complicated. Verizon Partner Program (VPP) partners looking to increase margin as they install more devices and handle more accounts are suddenly left with the hassle of managing the subscriptions, licenses, billing and the headaches that come with them. To combat some of the challenges you face as you grow, we’ve joined with RevX Systems to simplify the way you connect, monetize, and manage your IoT devices and subscription services. 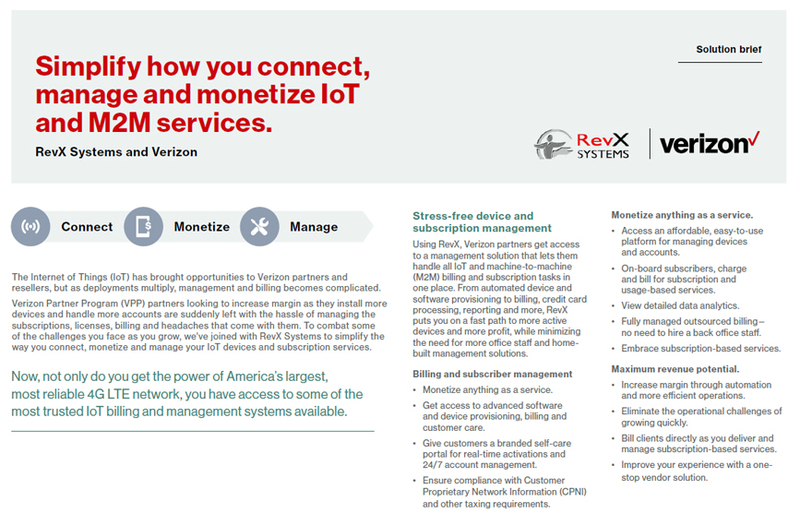 Using RevX, Verizon partners get access to a management solution that lets them handle all IoT and machine to machine (M2M) billing and subscription tasks in one place. From automated device and software provisioning to billing, credit card processing, reporting and more. RevX puts you on a fast path to more active devices and more proﬁt, while minimizing the need for more oﬃce staﬀ and home- built management solutions.